** Indira Gandhi National Old Age Pension Scheme is an ambitious pension scheme being run by UP govt. and central government. ** All the old citizens above 80 years of age will get Rs. 500 per month from central government. The new window will be opened click “Apply Now “option. In next window, click the “New Entry Form” link to open UP Old Age Pension Scheme Online Application Form. ** All fields marked with asteriek ( * ) are compulsory. ** The size of the applicant’s photo should be of max 20 KB. ** The documents should be upload in PDF format with maximum size of 500 KB. Step 17 : Browse and select the location where the scanned Photograph files have been saved. 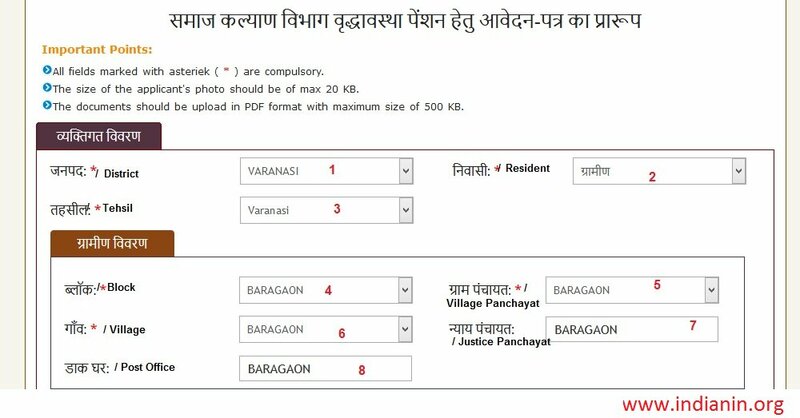 After Clicking Save button, the form is saved successfully and registration acknowledgement slip with Registration No is generated on screen which can be printed for future reference. Once the Registration form is saved it will be edited/updated for any correction unless the user clicks on Final Submit button on ‘Edit Saved Form/Final Submit’ page. ** Only after Final Submit of Application, Applicant can take the printout of Final submitted page along with supporting documents and physically submit it to the DSWO/DPO/DHWO office within one month from the date of Final Submit of Application form. ** After submission Applicant will receive computer generated acknowledgement receipt from respective office.